Malaysia's Prime Minister Najib Razak announced on Monday that according to new data, flight MH370 ended in the southern Indian Ocean. 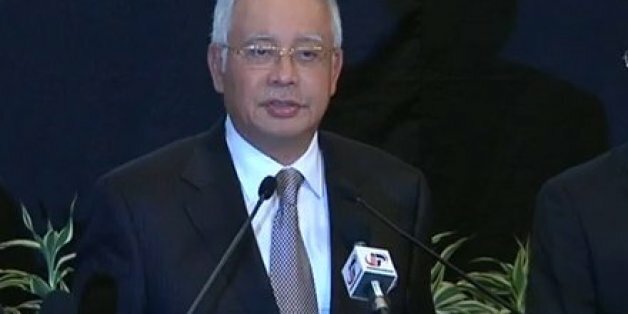 The prime minister said that analysis by a British company has concluded that the last position of flight MH370 was in the southern Indian Ocean. "This is a remote location ... it is therefore with deep sadness and regret that I must inform you that according to this new data, flight MH370 ended in the southern Indian Ocean," Razak said. Malaysia Airlines flight MH370 went missing more than two weeks ago after taking off from Kuala Lumpur for Beijing with more than 200 passengers on board. French and Chinese airplanes looking for debris of the jet had spotted several objects in the ocean on Monday. KUALA LUMPUR, Malaysia (AP) — A new analysis of satellite data indicates the missing Malaysia Airlines plane crashed into a remote corner of the Indian Ocean, Malaysian Prime Minister Najib Razak said Monday. But with the location of the plane itself still unknown — most likely somewhere at the bottom of the sea — profound questions remain about what brought down the aircraft and why. Officials have said that the plane automatically sent a brief signal — a "ping" — every hour to the Inmarsat satellite even after other communication systems on the jetliner shut down. This is breaking news. Check back later for updates.